Filicudi 3 star hotel on the sea with private beach and bar / restaurant overlooking the other Aeolian Islands. Reachable by ferry/hydrofoil from Naples, Palermo, Milazzo (Messina) and the other islands in the volcanic Aeolian archipelago. Snorkelling excursions available via the hotel as well as trip to Filicudi’s nature reserve, prehistoric village and scuba-diving centre. Close to the ferry landings on the eastern side of the Aeolian island of Filicudi, off the northern coast of Sicily. Private beach with all modern comforts and spacious public areas, including our exclusive terrace bar and meeting rooms. 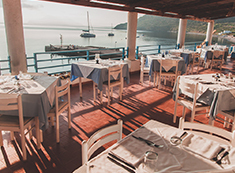 Our top quality restaurant serves up the freshest seafood dishes from the waters that surround us as well as a list of fine wines. Check our current deals and sign up for promotional codes via the Hotel Phenicusa Filicudi newsletter. The 3 star Hotel Phenicusa is located on the eastern side of the island of Filicudi, one of the Aeolian Islands situated off the northern coast of Messina in Sicily. 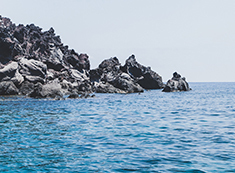 A naturally volcanic region, this stunning archipelago is made up of active volcanoes such as Stromboli which are an incredible natural wonder to behold. Largely unspoilt, you’ll find virtually no traffic on the island. The island of Filicudi can be reached be sea from Naples or Milazzo (in Messina) as well as from the other islands nearby. Note that to bring a car onto the island you’ll need to arrange a special permit. Tickets for transit by sea are easy to buy directly from the port and the summer sea is virtually never unkind to those of a weak stomach.